Besides Fountain Piterskiy Mostik, visit Булгаков in the vicinity. Russian cuisine is famous around the world and visitors advise you to taste it at this bar. Most guests recommend trying nicely cooked veal, Caesar salads and sockeye salmon. You can share tasty ice cream, chocolate fondant and passion fruit cheesecakes with your friends and spend a nice time here. Based on the guests' opinions, waiters serve good beer, bourbon or wine. Delicious lemonade, tea or coffee are the best drinks of Булгаков. Children can choose dishes from the kids' menu. The creative waitstaff works hard, stays positive and makes this place wonderful. Service at this place is something one can call fabulous. You will appreciate reasonable prices. 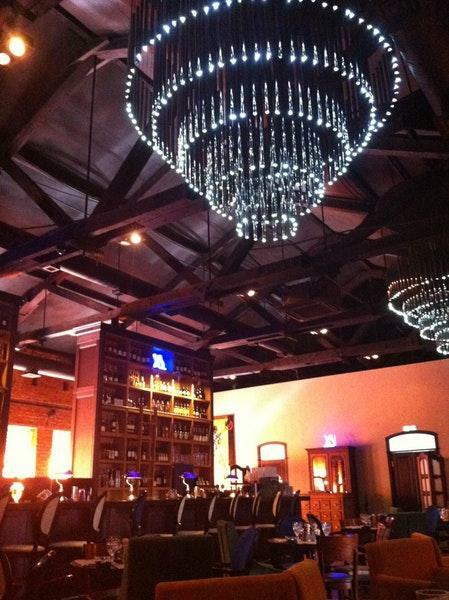 At this spot, people can enjoy the cozy atmosphere and divine decor. Clients have rated this bar 4.5 on TripAdvisor.